A human arm bone has been uncovered during an archaeological excavation of Neolithic buildings at Ness of Brodgar on Orkney. Archaeologists believe the bone was deliberately placed and could possibly be the remains of a respected original founder of the large complex. They added that there could be more bones still to be found. The University of the Highlands and Islands Archaeology Institute is leading the dig. 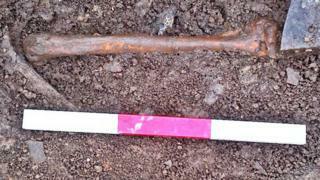 Site director Nick Card said the bone was an important and exciting find. He said there were several theories as to who the arm may have belonged to, including the possibility that it was the remains of an original founder of the site. But he added that the ideas would need to be backed by scientific fact. Archaeologists have been carrying out excavations of the complex of buildings at Ness of Brodgar, the location of the Ring of Brodgar standing stones, since 2002. Since 2002, Neolithic buildings, artwork, pottery, animal bones and stone tools have been discovered. Six years ago, archaeologists found proof that Neolithic people were using paint to decorate their buildings as well as using stone as roofing material. Radiocarbon dates from parts of the site suggest the complex was in use for about 1,000 years from at least 3200BC to 2300BC. The University of the Highlands and Islands is also involved in another dig on Orkney. Excavations at The Cairns on South Ronaldsay involve an Iron Age broch. Human remains have also been found at this site, as well as 2,000-year-old fossilised animal dung.